My Daughter Ellie Mae used to love her pacifier. Even the suggestion that she give it up brought a look of trouble to her beautiful little face. As she was approaching three years old, we sort of convinced her to give them up as a gift to her soon coming little brother, which she seemed cool with, until we actually moved towards removing them. When we got down to where the rubber met the road, she was uneasy about giving up her “Binky”. My wife and I reasoned that for a child a pacifier, is not only to shut them up, but it is a source of comfort, when anxious or afraid. In our thinking, if we could find something to replace that source of comfort, we could remove her “binkys”. One evening, while at the store, I had a plan: I would get a cuddly stuffed animal and bring it home. I would explain that when she is feeling alone or afraid at night she could hug the stuffed animal. She went for it. We named it “Daddy Doggy” after me of course. 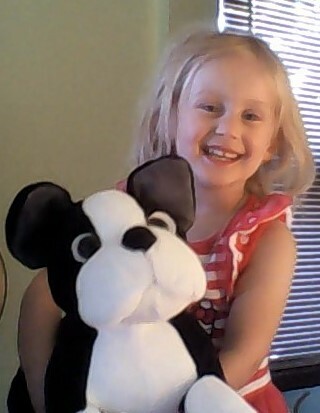 Now when she is afraid at night, she can hug “Daddy Doggy” and be comforted. Ellie Mae’s “Daddy Doggy” is a mere utility. It really is a cheap substitute for my presence, but as a utility, it serves a real purpose. Her little reminder of me is a source of comfort when she is afraid or feeling alone or even missing me, but it can be easily forgotten. Now that she has been away from her “binkys” for a while, she will even misplace “Daddy Doggy” as she has tons of other fury and warm stuffed things with her. At times she has suggested ,through his absence, that “Daddy Doggy” is not as necessary as he once was . I must admit that does hurt a little, being that he was named in my honor. Yet as much as it stings it is very true. As awesome as “Daddy Doggy” is, he is expendable. I wonder if we don’t view God in our relationship to Him that way at times. We as redeemed humans still struggle with the presence of God, even though Jesus act of redemption, brings God’s immensity and presence to us, through Christ in us the hope of glory (Colossians 1:27). His presence with us means comfort and the assuaging of our fear, for perfect love casts out fear. His presence among us does guarantee the meeting of all our needs through the riches of his glory in Christ Jesus. We like this truth about God for when we know we are in need, He is there to bring us the comfort we need, just like “Daddy Doggy”. When in need we hold to Him as if life depended. When the trouble passes we release from Him to handle other interests rising interests. We like a God who is like “Daddy Doggy” or like a jovial and attentive friend. We enjoy warm friendly relationships and want the one we have with God to mirror that. Interestingly one of the most popular worship songs over the past 20 years has been “I am a Friend of God”. I realize there is a small and very loose thread in the New Testament for us, where God word reveals Abraham was a friend of God. We are similarly to live by faith and works as Abraham did, but we are much more than “friends of God”, being children of God, where by we cry “Abba”. My inclination is that to Abraham and God being a friend was much more than what it has become in our culture. Friends in America are utilities for our pleasure. “Hey it’s my friend Bob, he taught me everything I know about hunting”…“There is Chuck, he always makes me laugh”… “Spoke with Tom the other day, what an encouragement”. These types of relationship are not bad in and of themselves, but they are based on what “I” get out of it. It is for this reason, that when “buddies” hit an impasse, they need to agree to disagree or get a new buddy. Truth be told, we are friends with people we generally have something in common with. Jesus definition of friendship was illuminated by His own life’s work, and he did not have much in common with the dregs of society He chose as friends. Jesus definition: “Greater love has no man than this, that a man lays down his life for his friends (John15:13). In Jesus life that meant rebuking them, commanding them, providing for them, dying for them and dwelling with them always. We want a relationship to God that is like Bob or Chuck or Tom or “Daddy Doggy”, where He makes us feel, special, alive, protected and favored. Although some of those characteristics are part of our relationship to God (Psalm 103:1-12; Psalm 91; Romans 8:1-17), they are not the foundation point. The foundation point is that He is with us: I Am is Emmanuel, God with us. He is not with us to be used as a utility, but as God to command us in His service. He is “Abba” present, but not for our comfort as the primary purpose. We are to carry out His primary purpose of bringing to His name glory through Jesus the first-born among many brethren. Here is my point, we want to get along with God like Bob, or Chuck or “Daddy Doggy”… I am afraid, where is my Daddy Doggy? How nice I can squeeze Him”… “Oh. Let me call Chuck, I am a bit lonely today, and would like to play some golf”… “Hey Bob, I need my engine looked at, your so mechanical, can you check it out buddy”… “Hey God, I need, I’m afraid, I hurt, I am without”… “How nice He is available for me, 24 hours a day”. See the problem, He is not available to us 24 hours a day, like a waiting friend or a stuffed utility. He is present with us 24 hours a day, and out of His in-exhaustible love He allows us to know Him. The only problem is that is we have it backwards. We exist to glorify God and enjoy Him forever. Enjoying Him comes form our being His utility, at His beck and call first and foremost. Yet this issue goes deeper in our experience than we often grasp. We have bought the limited relational mind set of “I am a friend of God” so much that we have shrunk the immensity of God to the size of a stuffed animal we can carry, and lose, or lose sight of until we need Him. Consider for a second, the immensity and overwhelming awesomeness of the God who saves. Consider that Paul tells a group of pagans that in God we all live and move and have our being. Consider that the universe He created cannot contain Him, yet He in all His immeasurable holiness and power, He dwells with those who are His through Jesus blood. consider He holds all things together by the Word of his power Consider He is Holy, He is past finding out, He Judgment, He is a consuming fire and who is angry with sinners and grieved by shallow saints. Although God is love, His immensity, perfection and eternity, is terrible in its awesomeness. We ought to at least be aware of this and directed by an sense of reverence. We ought to be aware that we are to be at His beck and call. His love is not the foundational point, although it is His ultimate motivation for our redemption. The foundation point of our relationship is FEAR, FEAR, FEAR… “The fear of the Lord is the beginning of wisdom”. It is fear of judgement that draws us to God’s love in the cross. It is reverence for that holy judgment in the cross, which we avoided in Christ, that brings the necessary sobriety for living as His possession.. This is why we are flagging in the church, as we have taken the wonderful and merciful nature of God, and left aside the stuff, which would truly drive us into His power and presence. We don’t need “Daddy Doggy” or another friend we need a God is Present to heal, convict and transform. 2 Responses to "Daddy Doggy"